This Cape Town Dining Guide shall help you to find the real gems in the Cape Town restaurant scene. 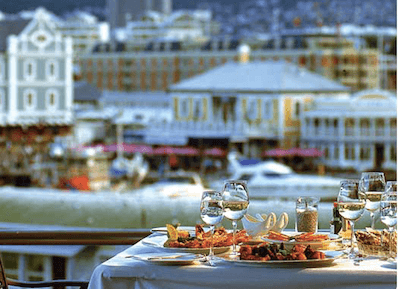 In Cape Town, there are so many great places for dining out that you are really spoilt for choice when eating out in the Mother City. So if you want to celebrate a birthday or anniversary in style, have a special business lunch in mind or want to treat your loved one for a special Cape Town dining experience on Christmas, New Year’s Eve or Valentine’s Day, you certainly will find the perfect gourmet destination on our guide. 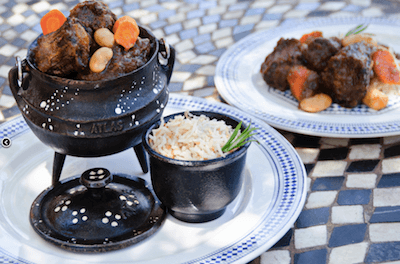 Expats in Cape Town and locals alike who do not wish to entertain family and friends at home are able to find great Cape Town restaurants for a fabulous dining out experience where you will be served gorgeous 'lekker' food. There you will enjoy a great ambience and receive outstanding service whenever you are visiting. Book ahead! Book your table at least a day ahead, so you can be sure to find your table prepared and ready for you. The popular restaurants are often booked out well in advance, so book as early as you can. If not prompted by the waiter, ask for the special of the day or any house specials. These local restaurants all will prepare and provide the freshest seasonal food available. Sometimes not all offers as written the printed or published menu will be available but often black boards instead will provide information on the special treats for the day. Make sure not to miss those! Pay a fair tip! Tip your waiter for great service with at least 10-15% of the bill. Remember to check if the tip has been added already, especially for tables of 6 guests or more as with larger groups the tip of 10-15% is already added to the total. 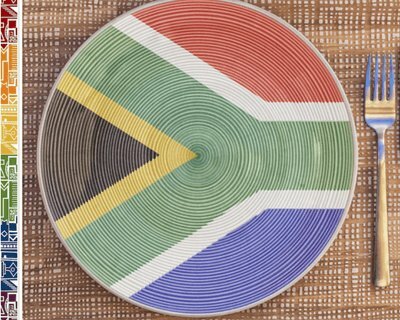 Whether you are a local or expat living in Cape Town looking for a special treat or are new to Cape Town and are looking for some highly recommended restaurants, you will find some wonderful places on our listing of our favourite Cape Town restaurants (in alphabetical order). This stylish Waterfront restaurant is renowned for the freshest seafood dishes and fine grilled food. Superb food and great views across the Waterfront grant this Cape Town restaurant a special treat. Baia is located on the upper level of the Victoria Wharf at the V&A Waterfront and you can be sure to find the perfect ambience for any special occasion or business dinner. 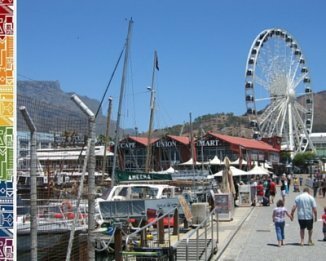 Cape Town dining at the V&A Waterfront Victoria Wharf. Tel: 021-421-0935. Website. Bloemendal in the Durbanville winelands guarantees for a really special South African Dining experience. They offer their special Cape Malay Buffett and the setting of the Restaurant is simply spectacular. The restaurant which is located on top of a hill offers 180 degree views. 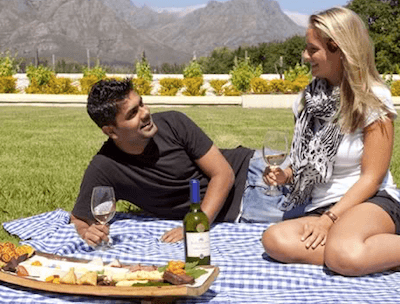 So you will gaze across the rolling hills of the Cape Winelands towards Table Mountain in the distance as well as the magnificent Stellenbosch Mountain ranges especially at sunset. Dubanville Hills, Racecourse Road (M13). Tel: 021-975-7575. Website. Do you love seafood or sushi and want to choose the cut of your fish fillet from the fish counter? Then this is the right place for you. The atmosphere is relaxed but stylish. The views of Table Mountain and the city lights from their window tables are complimenting the delicious food on offer. Come to see the stunning sunsets over Table Mountain and you will have an unforgettable evening for sure. Bookings essential, this place usually is really busy in the evenings. Enjoy sushi all-you-can-eat specials on Wednesdays and Sunday evenings from 5pm-8pm. Blouberg, Marine Drive off R27. Tel: 021-556-5464. Website. The food in this Cape Winelands restaurant is delicious, tastes 'home-cooked' and is prepared with so much love you can taste this! There are many local dishes on offer and you will enjoy splendid views over the green winelands. Remember to visit also their cheese shop where you can taste and buy delicious goats' milk and cows' milk cheeses, fresh breads and local delicacies. They also have got a wonderful terrace outside the Restaurant and a lovely garden and not to forget watching the goats will keep the kids busy. Suid Agter Paarl Road. Tel: 021-863-3609. Website. 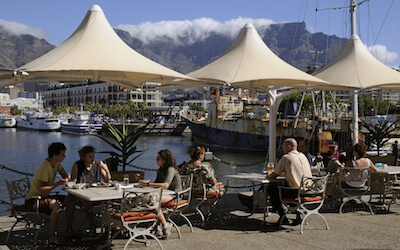 This is another one of our favorite Cape Town dining spots at the Cape Town Waterfront. The owners are originally from Belgium and so the mussels and French fries as well as their pepper steak are truly Belgian style. Go and try out, we have lived in Belgium for a while and the food at Den Anker really comes next best thing to enjoying Belgian fare over there. 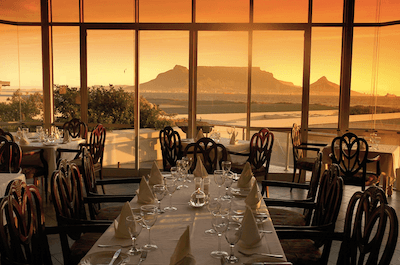 The location is fabulous too, go there for a lovely sunset dinner and see the Table Mountain change its colors. Lovely place for a romantic dinner or relaxed business meetings. Make sure to book ahead! V&A Waterfront Pierhead. Tel: 021-419-0249. Website. This fashionable restaurant in a well restored old barn in the Noordhoek Farm Village is offering gourmet food in a relaxed setting. This is a great place for family celebrations, as kids can run about in the newly refurbish playgrounds just outside the restaurant. 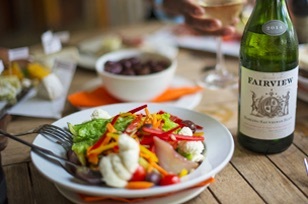 Read more about my Cape Town dining experiences at French chef Franck Dangereux’s Food Barn here. Noordhoek Farm Village. Tel: 021-789-1390. Website. 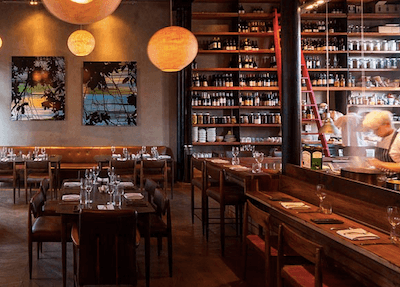 This award winning Cape Town restaurant is a fabulous place to go for a really special (business) lunch break or dinner if you want to enjoy haute cuisine in Cape Town. Luke Dale-Roberts' kitchen provides high quality, creative and perfectly arranged and above all delicious tasting food. They also cater for larger functions, but always make sure to book well in advance! Sundays and Mondays closed. 375 Albert Road, Cape Town Woodstock. Tel: 021-447-2337. Website. 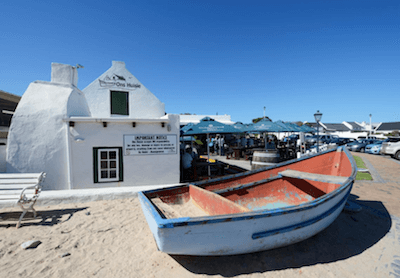 Do you want to indulge in a local South African seafood and experience Cape Town dining in one of the oldest buildings of the area? 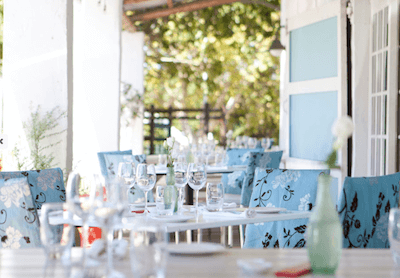 The restaurant set in an old fisherman's cottage is right across the one of Blouberg's most popular beaches. You will be seated either on the rustic terrace or in the various tiny rooms on wooden benches around smaller rustic tables. The seafood on offer is well presented either as curries in typical potjies or on huge plates. Bloubergstrand, Stadler Road off Marine Drive - follow signs to Small Bay. Tel: 021-554-1553. Website. Picture clipboard on this Cape Town Dining Guide shows from the left: 1. Blaauwklippen Estate, 2. View from Bloemendal Restaurant, 3. Lunch at Jardine (now closed), 4. Inside the Noordhoek Food Barn, 5. Seidelberg Wine Estate (now Spiceroute). Subscribe to our newsletter - It's free!